Right now, the stores and farmer’s markets here are overflowing with plump, sweet cherries. The kids eat a huge handful every day, as I think they’re best served fresh and unadorned. 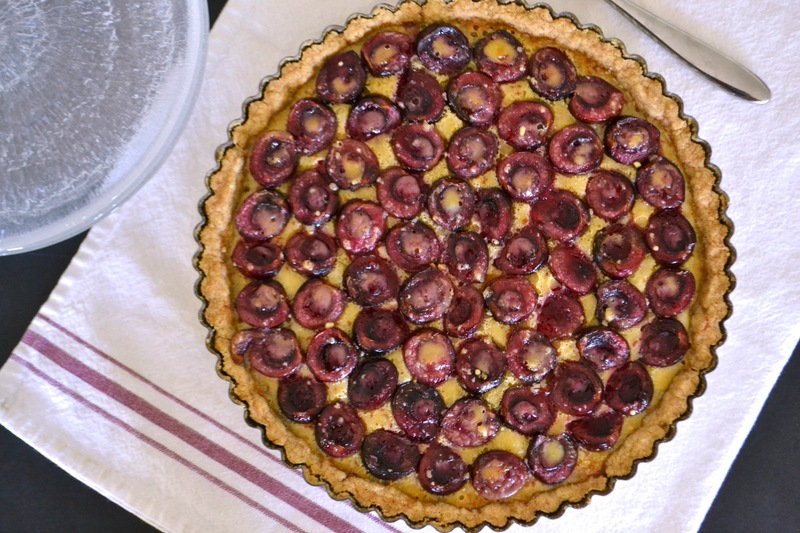 However, another great way to use cherries is to cook them into a dessert, such as a tart or clafoutis (recipe for the later coming soon). 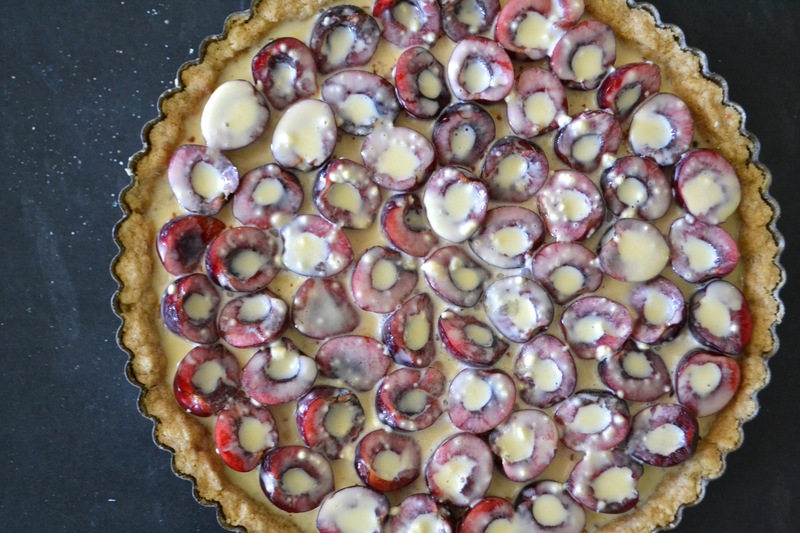 Unlike the Luscious Strawberry Tart I recently featured, the fruit in this recipe gets cooked inside a shallow layer of simple custard-like filling. 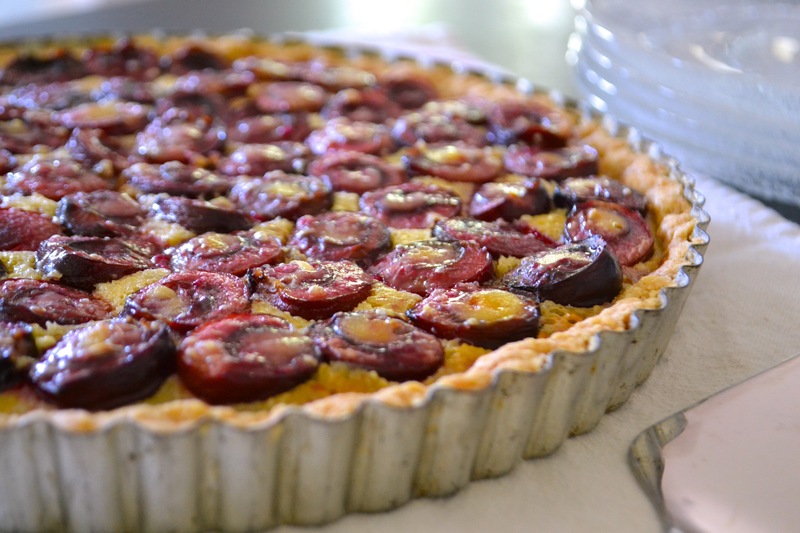 I usually make this recipe with apricots, but cherries or raspberries also work well. 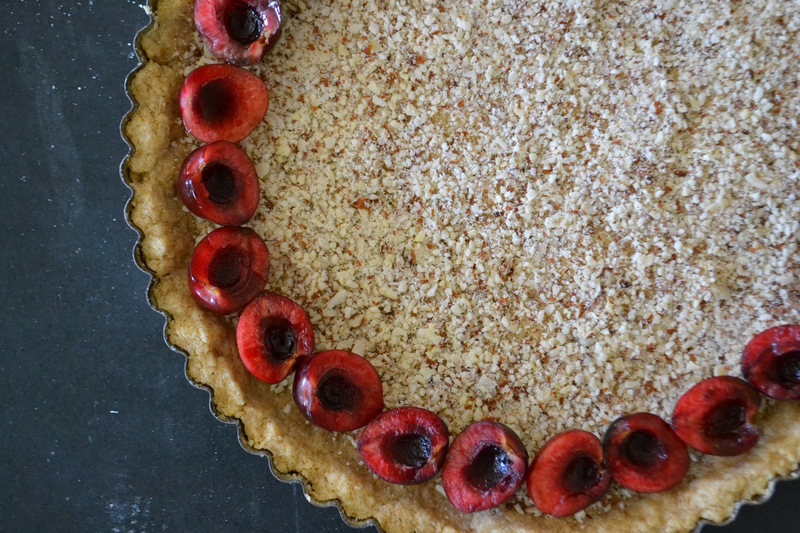 The crust recipe is the same half whole-grain crust I use for the strawberry tart. For the crust: Heat the oven to 375 F. Mix the flours, salt and 2 tbsp of sugar in a medium-sized mixing bowl. Using a pastry cutter or two knives, cut in the chilled butter or coconut oil until the mixture resembles coarse crumbs. Sprinkle in a little ice water and continue to mix until the dough just barely starts to come together but is still quite crumbly. Do not overmix or your crust will be tough. Press into the bottom and sides of a 9-inch tart pan. Prick the bottom with a fork. Bake for 15-17 minutes until the crust is golden and slightly puffy. While the crust is baking, prepare your cherries by washing and drying them before cutting them in half lengthwise and removing the seeds. Set aside. In a small bowl, lightly whisk the egg. Whisk in the cream, honey, vanilla and almond extracts and superfine flour until thoroughly blended. Sprinkle the finely chopped almonds over the bottom of the crust. This will help keep your crust from getting soggy. 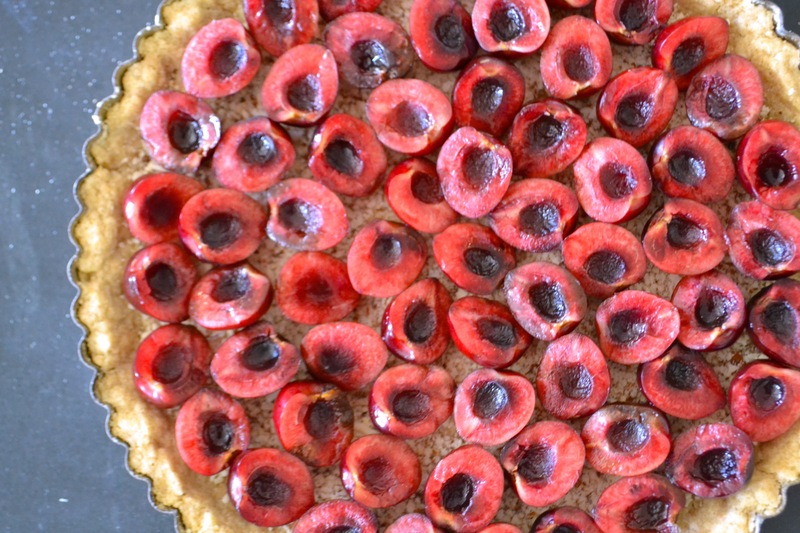 Place the cherry halves, cut side up, on the bottom of the tart, making concentric circles, starting on the outside edge and working your way in to the center. Spoon or carefully pour the cream mixture evenly over the cherries. Place the tart back in the oven and cook for 45-50 minutes or until the “custard” is set. Let cool and serve at room temperature. For a fancier presentation, dust the tart with a little powdered sugar before serving. I knew this tart would be sweet enough without the additional sugar, so I skipped it.